For works with similar titles, see Stabat Mater. Stabat Mater Dolorosa, often referred to as Stabat Mater, is a 13th-century Catholic hymn to Mary. 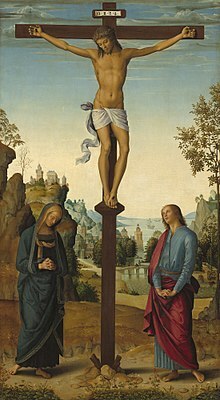 It is generally ascribed to Jacopone da Todi, but has also been attributed to Pope Gregory I, Bernard of Clairvaux, Pope Innocent III, St. Bonaventure, Pope John XXII, Pope Gregory XI, and others. It was used as the liturgical sequence for the Catholic Feast of the Seven Dolours of Our Lady.